Sweet and chewy Brachs jelly bells. A favorite old time Christmas candy. Each bag comes with gummy type candy bells in red and green. A delicious fruit flavor of cherry and lime are mixed in this bag. This are a perfect candy just to eat, but is also great to use if you are making a gingerbread house or to add to your holiday baking. 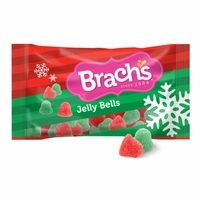 Brach's Christmas Candy is one of the most popular old time candies for the holidays. They have been around since 1904 making delicious treats from days gone by. We have all of the old fashioned vintage Christmas Candies.